Rather like The Hurt Locker (2008), the directorial debut of Oren Moverman continues to find the devil in the details when it comes to the fallout of America’s recent overseas entanglements. 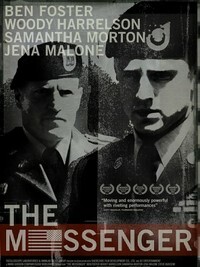 Whereas Kathryn Bigelow’s film got into the nitty-gritty of an active bomb disposal unit, The Messenger (made in 2009, its release delayed in the UK) explores the hitherto little-known activities of the Casualty Notification Team. On returning from duty in Iraq where he was wounded by an IED, Staff Sergeant Will Montgomery (Ben Foster) is assigned to a unit whose nightmarish and gruelling task it is to inform family members of the death of their loved ones in war. Partnered with an eccentric career officer and recovering alcoholic, Captain Tony Stone (Woody Harrelson), the film initially inducts us (alongside Will) into a world of grief and suffering. There is a protocol to be followed - don’t park the car near the house, no physical contact - and a script to be kept to, which is in some way supposed to cushion the blow. But speed is of the essence. They have to be there before Fox and CNN, Stone says. In this aspect the film superficially resembles Up in the Air (2009): both films are about the bearers of bad tidings and their own particular woes. These soldiers have their own demons to confront even as they are met every day by almost unbearable scenes of pain, which they are complicit in causing. In fact, it would be hard to pick anyone less robust to do the job than Will, who is obviously on the edge from the very beginning, continuing a relationship with an old girlfriend who is about to marry a mutual friend. Foster’s performance gives his character both a vulnerability and destructive tightness as he tries to hold himself together, and the rage and pain in. Woody Harrelson, who has recently been notching up a series of decent bit parts, is here granted room for a more expansive performance. He clearly enjoys the opportunity, giving it by turns a mad-eyed gusto and an occasional moment of pathos and quietness. Despite the strength of the central pairing and the development of their relationship, the film really belongs to the vignettes of the families to whom Will and Captain Stone must deliver their news. The diversity of their reactions and the banal mistakes that are made make each notification felt: the repetition is anything but numbing. The film’s emotional heart lies here, and an excellent cameo by Steve Buscemi is a particular stand-out moment. The problem with the film starts when the screenwriters (Alessandro Camon and the director) try to draw out a larger over-arcing narrative which we are supposed to care about. Will’s relationship with his ex-girlfriend seems trivial and boorish compared to his day job. Indeed, even Will’s particular grief and the possibility of a nascent romance with a war widow, played by Samantha Morton (something we don’t need to be told is probably against protocol), appear small and uninteresting when compared to the vibrant panorama of pain that those stories are set against. This review was published on May 12, 2011.